The fast path to the truth is your employees. It’s something that every business owner must understand. Leaders who don’t roam around their company are wasting their most valuable asset – people. Grow Great is all about higher human performance. Namely, YOURS. By extension, your people…all the employees who do the work! Jeffrey Gitomer is known for saying that people can say one of three things about you: something bad, nothing or something good. And it’s up to you what they say! 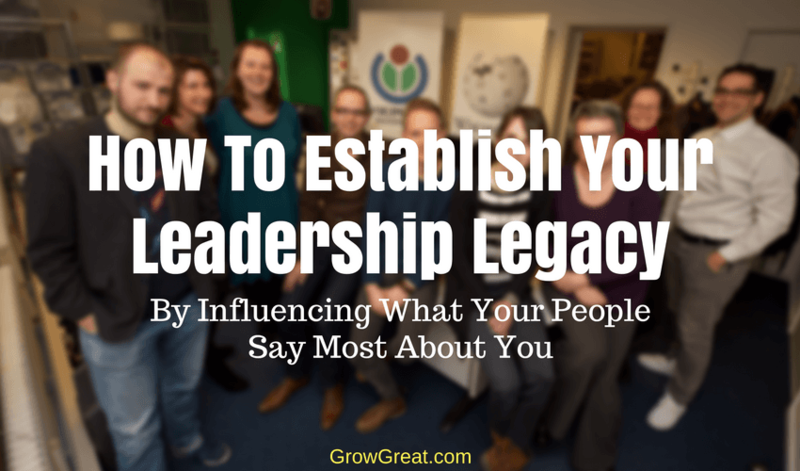 The question about your leadership is, “What are people saying about you?” That’s your leadership legacy. It’s not what you hope they say. It’s not what you think they say. It’s what’s actually being said. Not troll-like lies. Not the people who have no clue about who you really are. It’s about the people who know you well. And those who know you better than most. It’s about family, friends, employees, customers, peers and partners. What do they say? You say some things to yourself. Maybe it’s inner critic stuff. Maybe it’s high praise. I’m thinking of the people I’ve met through the years who talk in 3rd person and use terms like “brilliant” and “genius” to describe themselves and their work. Talk about awkward and tough conversations. But some people can roll that way I guess. Most of us lean more toward inner critic I suspect. Even the most self-aware among us have a perspective that isn’t likely shared by those who know us best. This can be really hard stuff to dig up because people have filters. Political correctness. Politeness. Fear. It all hampers candid conversation directly to your face. Unless you’ve got a Kosmo Kramer in your life. Jack Welch was the first business leader I heard openly talk about it. I loved him for it because I had long thought it was high under-valued. I was in my early-mid 20’s and I didn’t hear anybody talk about it except Jack. I had always embraced it professionally, and as much as practical personally. But I’m a communicator who openly joked with my kids that they had a dad who wasn’t likely going to die having left very much unsaid. Verbal expression isn’t hard for me. Maybe that’s why I so admired Mr. Welch. Not just his words, but his candid actions, too. It’s difficult for most. To say what they really mean. To mean what they really say. All this beating around the bush. All this business jargon. You won’t likely remember him, but you should go to a used bookstore (likely the only place you’ll now find his work) and buy books by Edwin Newman. He was a journalist who worked mostly for NBC. He was fanatical about the use of language, namely our own English language. In 1974 he published a book, Strictly Speaking: Will America be the Death of English? Then in 1976 he published another one, A Civil Tongue. Both are worth reading and will provoke you to re-think how you say things. Which leads me back to our main focus – what people say about YOU. More precisely, what people say prompted by how they feel about you. It’s about the behaviors, actions and words that people use as a basis of judgment. Maybe we’ve never met, but you have some sense of me by listening to the podcast. Maybe you like me. Maybe you don’t. How I view myself – or hear myself – is of no consequence when it comes to how YOU judge me. Except that my own views spur me to behave, act and speak in certain ways. You may think the podcast is an utter waste of time. Is that my leadership legacy with you? Yep. And as a podcaster I’m okay with it because I know I’m not for everybody any more than everybody is for me. Is your opinion valid? Completely. For you. But the good news for me is that you don’t get to determine how everybody else may feel about me. You can jump on social media and try to rally others to hate me because you hate me. Or you can embrace your own hatred and just leave it at that. That’s the world we’re in today. Sharing opinions is the game. I don’t resist it. Rather, I embrace it knowing that people willing to judge based solely on the assessment of a hater aren’t likely going to be my cup of tea either. So I figure we all win in the end. But you may enjoy my work and find what I say congruent with your point of view. You may think leaders should be the #1 servant in the company. You may think their primary role is to get all the crap out of the way of their people so the work can be performed better. You may like that fact that I speak and breath at the same time, purposefully building in meaningful pauses for the words/ideas to be more deeply processed. And if you do, then we’re much more likely to be kindred spirits with more in common. That’s a win for both of us, just like with the haters. Except unlike the haters, you and I can keep building on this and forge a closer relationship. Yes, that’s what we’re talking about. Hopefully most people are operating with candor as they privately assess us. I like to think so. That doesn’t mean they’re communicating with candor as they assess us. That’s the disconnect. Thinking or feeling one way, but saying something different. When a leader can get an honest appraisal from people of how they truly feel about him, then you’ve got some real data that can be used to move you forward. But only if you handle it properly. I can illustrate with some close friendships I’ve had over my lifetime. I lean naturally toward being an introvert. Not backward, just preferring to spend time alone, with one person, or with a very small group. Given the choice between a big ballroom full of people or an intimate chat with just one other person — I’m picking the intimate chat 100% of the time. I get much more energy from deeper conversations with a few than a litany of shallow conversations with many. As a result I’ve had some very close, deeply personal relationships with a handful of people outside my family. I can probably list them on one hand, proving how rare these kind of relationships are. And proving how valuable they are, too. Keep in mind these are close friends. Friends who know how I roll with candor. Friends who had proven their own ability to exercise candor with me. Only 1 responded. The others just left well enough alone. I’m not indicting any of them. I’m only illustrating how hard this is to flesh out…even among friends. Here’s the good news for business owners. With employees, it’s easier. I know because I do it regularly. When employees know (not just when they feel it, but when they genuinely know) that’s it safe to share, they will. As I roam around an organization and engage in conversations about what’s going on, what can be improved, what’s broken and all the other pressing things on people’s minds…I can quickly find out how people view the boss. And I can always take that feedback back to the boss in a completely anonymous way (which is the ONLY way I would ever do it). A picture begins to develop when you gather the perspectives of enough people throughout an organization. An accurate picture. Sort of like those gymnastic or diving judges in Olympic competition, if you throw out the highest score and the lowest score…you begin to get a good idea of reality. In every company there’s the naysayer who thinks the boss is a moron, incapable of tying his own shoes. No matter what the boss does, this person is going to be critical. Throw out the low score. Then there’s the rah-rah-I-love-the-boss employee who fawns all over the boss and wouldn’t be caught dead thinking or saying anything remotely negative. Toss out the high score. Now there’s everybody in between. That’s the current legacy of the leader! It’s what those people are saying. I preach a few fundamental messages in my work. Among them, “The quality of our questions determines the quality of our business.” I find out stuff because I ask. Then I shut up and listen. Throughout the years I’ve encountered business owners who have a different course of behavior. They think as long as they’re talking, they’re leading. While I use the art of the pause, they don’t dare use it for fear somebody else will start talking. Their employees notice. How could you not? Does this leader want that legacy? Does it matter what he wants? Sure it does…because he can change it based on the feedback. Some do. Most don’t. Which saddens me. That so many leaders could be building a great legacy of serving their people and their company by acting in ways that would foster a positive change in what people – their own employees – say about them. Sadly, Steve Jobs is the business hero for too many people. A jerk of the highest order who belittled people and railed on them. But people covet his success forgetting what might have been if he’d been a better human being. Forgetting the possibility that success might have been achieved more quickly and risen higher had he learned the power of collaboration, cooperation and serving others who were part of it all. I’m not romantic about such people. For me, it’s not the results as much as the unrealized potential. Because I fundamentally believe that great leadership isn’t tyranny or autocratic lunacy. Because I believe great leadership elevates the performance of people, which in turn elevates the performance of the company. And the business owner – YOU – are the Chief Leader. First, get honest feedback. Don’t focus on yourself. Don’t ask people, “How do you feel about me?” Instead, I’m going to push you to spend 10 minutes a week with your employees one-on-one. For some of you, that means you’ll be able to sit down with every single employee every week. That’s a blessing. To operate a business where you can still do that is terrific. Seize that opportunity starting this week. Get those meetings scheduled right now! For some of you it’ll mean you can only meet a portion of your employee base each week. That’s okay. Squeeze in as many as you can, but do it every single week. And when you’ve gotten around to all of them, start over and repeat. Probe to find out what their frustrations and roadblocks are. Make it all about them, not you. Listen carefully. Not just for what they say, but for how they say it. A word of warning. At first they’ll be hesitant. You’ll have to convince them it’s a completely safe environment. Nobody should be in the room. Just you and this employee. Nobody else. Assure them that you’re interesting in helping every employee get around, over or through whatever constraints may stand in their way of higher performance. Reiterate that you’re there to serve them. Ask your question, then shut up and listen. Ask clarifying questions to make sure you properly understand. Be careful to make knee-jerk promises. Don’t offer platitudes, “Well, we’ll look into that.” But reassure them that you want to dig deeper into this for the best solution possible. “Thanks for being bold enough to bring that to my attention. Would it be okay if as I dig into this for me to circle back around to you if I need more information?” Make them part of the solution, not merely a person who is alerting you to a problem. Second, act on everything your employees bring to you. Nothing will kill morale more quickly than not being heard. And that means I told you, but you didn’t do anything with it. Even if the action is small make sure the employee knowns you’re doing something. It signals to the employee that the meeting was worthwhile because you heard them. It also tells them you’re remembering it enough to do something…even if doing something is looking into it. Remember to be candid. Tell it like it is. Don’t fluff it. But don’t minimize it either. The problem may seem insignificant to you – and perhaps it truly is – but the employee brought it up. It has some top-of-mind importance to them. Part of your task may be to find out why…especially if there are obvious things that should be far more important to the employee. Third, be helpful by giving advice to the employee. Imagine how you’d feel if the owner summoned you to find out what your problems were, then listened as you told him…but then ended the conversation by telling you how you could be better/get a promotion/move to a more desired department/etc.? Here’s how you can do it. After the “What can I help you with?” question is discussed, end with, “How can I help you personally with your goals here?” Make this question about them and their career advancement. Make sure they know that’s the context. You want to help them achieve whatever they can. You’re here to make them better by serving them individually. Again, embrace candor. Be honest with them. This isn’t an HR meeting where you’re correcting poor behavior or performance. This is human conversation where as the mentor (the business owner) you can give them life advice on what they can do, from your perspective to enhance their value while achieving what’s most important to them. Keep in mind that their goals are going to be individual. Don’t push against that. Some want to buy a new car while others want to pay off the old one. Some want to start a family while others want to prepare for their grandkids. Some want a vacation to some distant place they’ve never been before while others want to install a swimming pool. Whatever they want is whatever they want. You want to help them achieve that as much as it’s possible within the context of the company. Three simple things that are hard. But powerful. Three simple powerful things that will change your leadership legacy forever. Only if you do it. And keep doing it. In time, you’ll begin to learn some things about yourself that will make you better. Practice these things and you’ll become better. Quickly. That’s what I want for YOU.